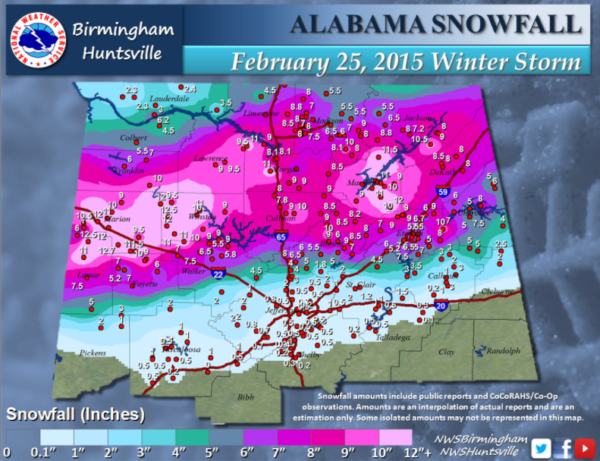 A historic snowstorm impacted the state of Alabama on this date in 2015. An intensifying surface low moving across the northern Gulf of Mexico was the culprit. The bullseye was generally along the US-278 corridor south of the Tennessee River in North Alabama. A foot of snow fell across parts of Marion and Winston Counties, including 12” at Natural Bridge, 12.7″ at Guin and 11 inches at Hamilton and Haleyville. Six inches or more of snow fell across a wide area from Etowah and Cherokee Counties on the east to Walker and Marion counties on the west. The Huntsville International Airport picked up over 8 inches of snow from this event, making it the 4th biggest single storm event there and the third biggest single-day total. It was the second biggest single-day snowfall of record at Hamilton with an 11 inch total. At Haleyville, the 12 inch total is the fourth biggest single-day snow. For Hamilton, the 12 inches that fell in the 2015 snowstorm was second only to the 1963 New Year’s Eve storm, which dumped 14 inches there. In the Birmingham area and across much of the rest of Central Alabama, snow lovers were disappointed as amounts were barely enough to measure. 0.7 inches fell at the Birmingham Airport. No snow fell south of the Birmingham Metro area. It was a close call on the forecast, as temperatures at 5,000 feet and below were right on the borderline between producing a heavy snow event or a cold rain.